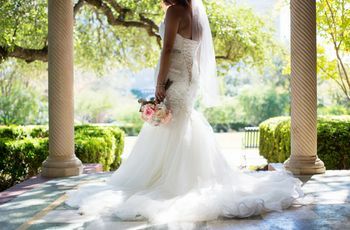 Whether you idolized Mandy Moore’s playful polka-dot dress or joined the Meghan Markle minimalist fan club, celebrity wedding dresses made just about every bride-to-be swoon this year. The year 2018 was filled with some of Hollywood’s elites exchanging “I dos,” so it’s no surprise that brides are dying to copy these fashionable looks. 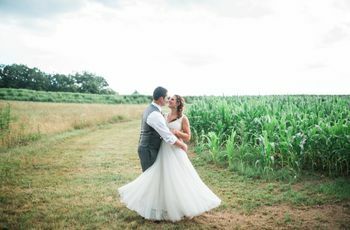 After all, the majority of 2019 wedding dress trends were inspired by wedding dresses worn by stars. So, if you’re hoping to walk down the aisle in a celebrity-inspired wedding dress, you’re in the right place. We’ve rounded up some of the best celebrity wedding dresses from 2018 with a doppelgänger design so you can recreate your favorite look. These gowns are almost identical to our favorite celebrity wedding dresses from 2018. This look is a bit more provocative than Priyanka Chopra’s custom Ralph Lauren wedding gown, but you can still achieve a similar wow-worthy vibe in this design by Inbal Dror. Featuring a high neckline paired with sheer illusion and hand-embroidered details, Inbal Dror’s revealing gown definitely reminds us of Priyanka Chopra’s celebrity wedding dress. Just add an extra-long tulle veil and opt for Jimmy Choo heels and you’ll totally replicate the actress’ gorgeous wedding style. Karlie Kloss wowed in a classic celebrity wedding dress. We think this lace masterpiece by Gracy Accad is right on the money. Featuring illusion lace sleeves paired with a sheer lace neckline and voluminous skirt, brides will definitely give off Karlie Kloss vibes in this gown. While this celebrity wedding dress look-alike isn’t the same color as Mandy Moore’s darling blush Rodarte gown, it still features a similar feminine design. 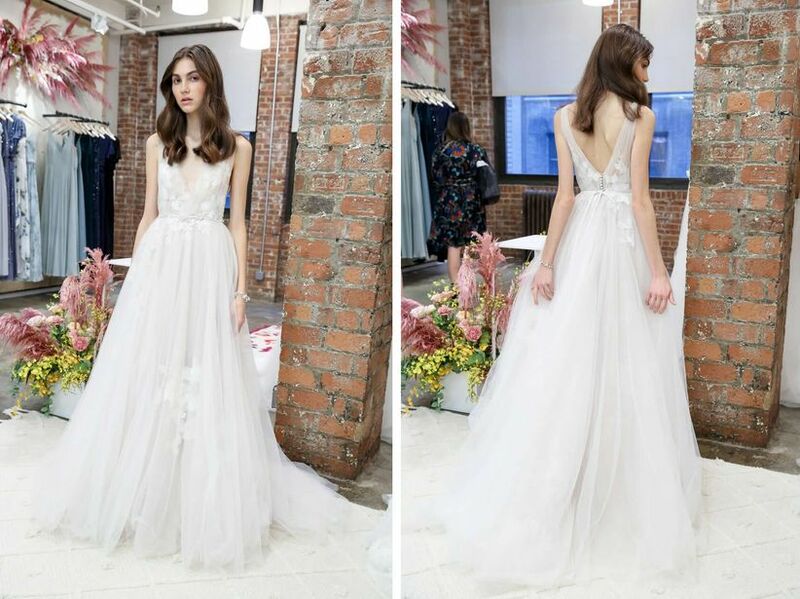 Sassi Holford’s tulle layered wedding dress comes in a traditional white, but still gives off a flirty and playful vibe with the help of floral lace flutter sleeves. Virginia Williams married rapper Pusha T in an romantic floral embroidered Marchesa gown, but then switched into a strapless and minimalist Reem Acra gown after the ceremony. 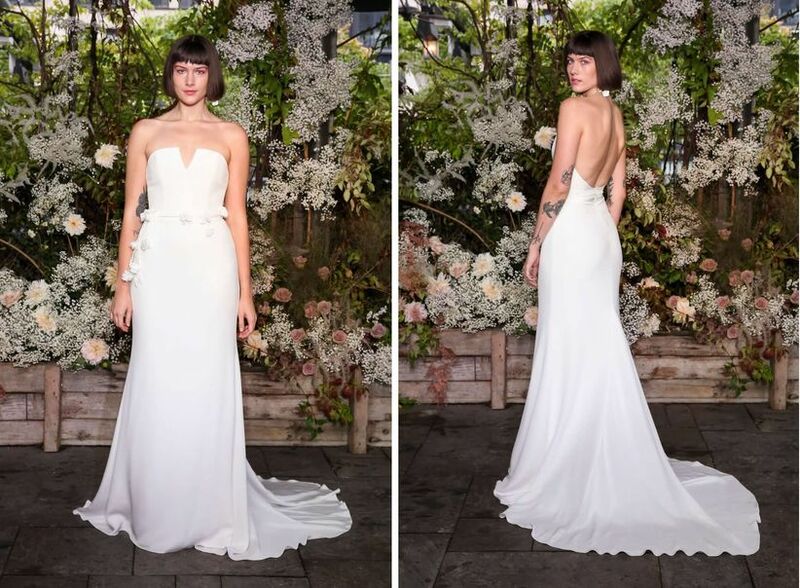 So, if you’re hoping to have an outfit change on your big day, then we think this clean Alexandra Grecco totally matches Williams’ reception style. 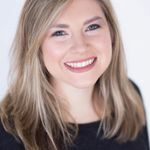 With a structured V-neck and unadorned fabric (minus a few floral accessories), brides can easily have a celebrity-inspired wedding dress by opting for this design. Brides can totally copy Amy Schumer’s romantic celebrity wedding dress by wearing this gorgeous lightweight gown. BHLDN’s soft and airy A-line features similar floral appliques and is totally made for an outdoor or oceanfront affair, just like Schumer's Malibu wedding! 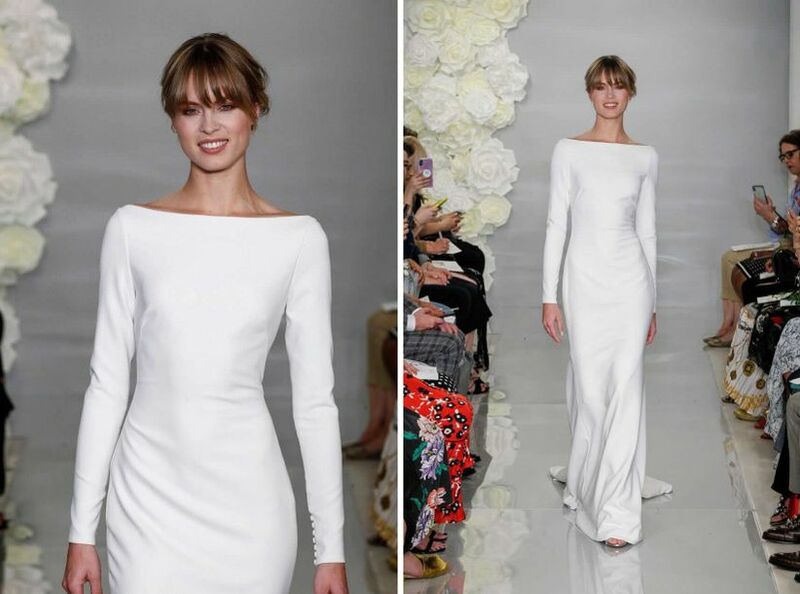 If you’re dying to wear a celebrity wedding dress that gives off major Meghan Markle vibes, dress designer Theia has you covered. 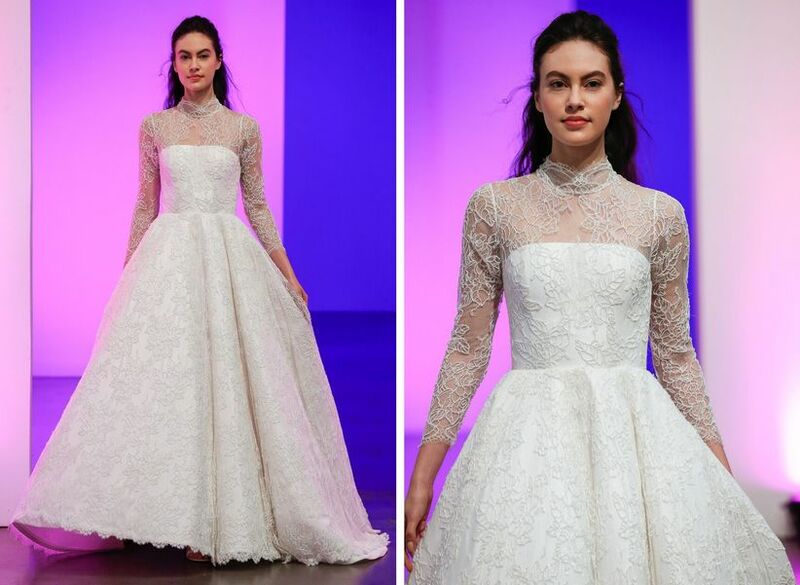 Theia’s clean and modern gown features a Meghan Markle-inspired neckline, sleeve style, and fitted silhouette, which definitely lets brides feel like royalty on the big day. To recreate Hilary Swank’s ethereal and eye-catching wedding-day look, we think you should opt for this whimsical design. Rivini by Rita Vinieris wedding dress features elaborate detailing paired with a relaxed fit, which is a great option for boho-chic brides. Even though the design has a bit of deeper neckline than Swank’s, the flowy sleeves and lace fabric of Rita Vinieris’ gown creates an effortless, chic look that’s ideal for a garden or outdoor affair. Princess Eugenie wowed the world in an exquisite off-the-shoulder gown. 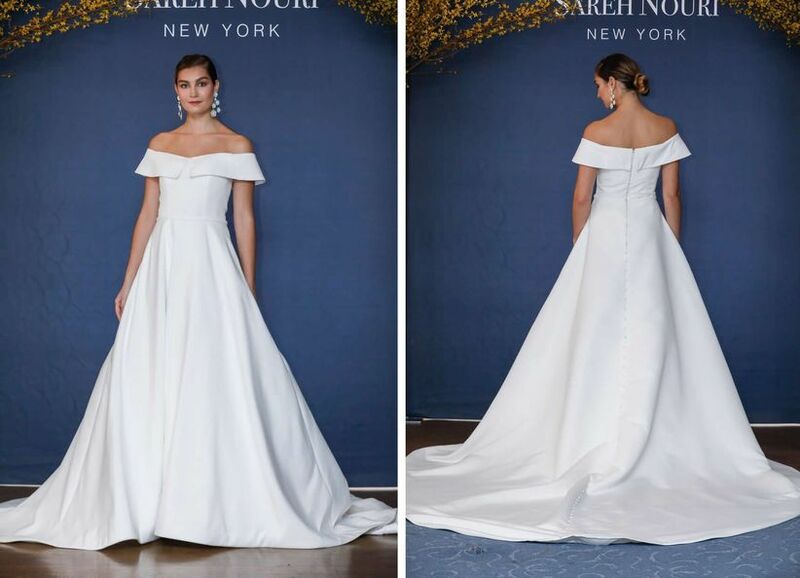 Sareh Nouri’s A-line beauty reminds us of Princess Eugenie’s celebrity wedding dress with the help of its folded neckline and wow-worthy skirt and train. Just request to add sleeves when working with a seamstress and you’ll instantly achieve a look that feels princess-worthy.